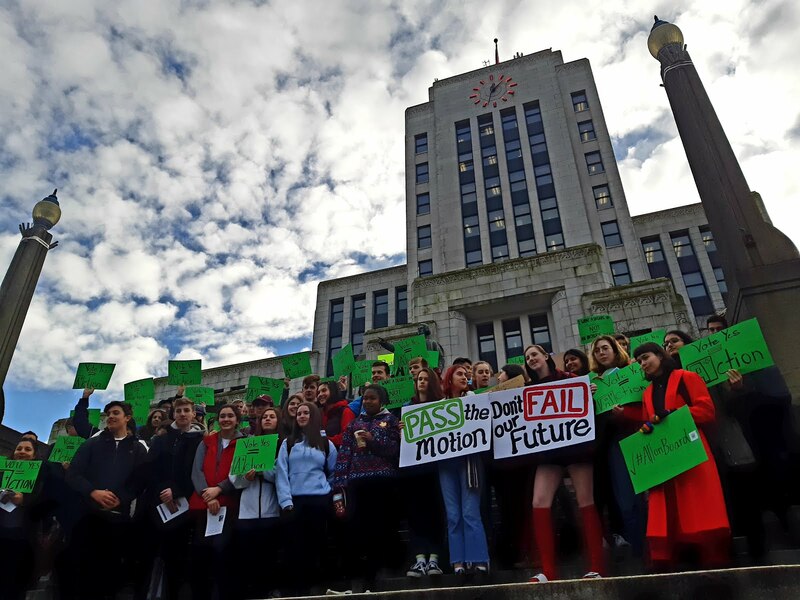 [VANCOUVER, BC, January 16] - Today, students from across Metro Vancouver walked out of school in support of Councillor Christine Boyle’s motion to declare climate emergency. Their creative action at City Hall steps emphasized the choice city councillors are making when they vote on the motion later today. “We are at a crossroads. We can continue failing to reduce emissions, resulting in accelerating climate catastrophe. Or, we can take dramatic action now, creating a safe future for our generation.” says 16 year old organizer Rebecca Hamilton. “We are demanding our leaders choose the latter path." Around 50 teens participated, along with around 30 adult allies. The action was supported by local organizations Force of Nature Alliance and Extinction Rebellion Vancouver. Three of the teens will also be speaking to City Council in support of the motion, which is being tabled by Councillor Christine Boyle of OneCity. It aims to strengthen the city’s emissions reductions targets, focussing on equitably mitigating the climate crisis. If passed, Vancouver would become the first city in Canada to declare climate emergency, and would be joining London, Los Angeles, Oakland, and other cities across the world in doing so. The teens also met with members of the Sustainability Group at city hall to hear about what the city is doing to reduce GHG emissions and to voice their concerns about urgent climate action. 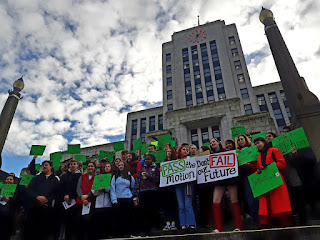 "We are living in a time of climate crisis and, as teens, we struggle to reconcile that knowledge with the lack of action we see around us.” Rebecca says, "We are modelling emergency in our lives by striking from school one day a month, and today’s Climate Emergency motion gives us a chance to see this urgency reflected in the actions of our leaders." Press statements will be disrupted after councillors vote on the motion.